English poet and dramatist, was baptized on March 3rd, 1606; he was born at the Crown Inn, Oxford, of which his father, a wealthy vintner, was proprietor. It was stated that Shakespeare always stopped at this house in passing through the city of Oxford, and out of his known or rumoured admiration of the hostess, a very fine woman, there sprang a scandalous story which attributed Davenant's paternity to Shakespeare, a legend which there is reason to believe Davenant himself encouraged, but which later criticism has cast aside as spurious. In 1621 the vintner was made mayor of Oxford, and in the same year his son left the grammar school of All Saints, where his master had been Edward Sylvester, and was entered an undergraduate of Lincoln College, Oxford. He did not stay at the university, however, long enough to take a degree, but was hurried away to appear at court as a page, in the retinue of the gorgeous duchess of Richmond. From her service he passed into that of Fulke Greville, Lord Brooke, in whose house he remained until the murder of that eminent man in 1628. This blow threw him upon the world, not altogether without private means, but greatly in need of a profitable employment. He turned to the stage for subsistence, and in 1629 produced his first play, the tragedy of Albovine. It was not a very brilliant performance, but it pleased the town, and decided the poet to pursue a dramatic career. The next year saw the production at Blackfriars of The Cruel Brother, a tragedy, and The Just Italian, a tragi-comedy. Inigo Jones, the court architect, for whom Ben Jonson had long supplied the words of masques and complimentary pieces, quarrelled with his great colleague in the year 1634, and applied to William Davenant for verses. The result was The Temple of Love, performed by the queen and her ladies at Whitehall on Shrove Tuesday, 1634, and printed in that year. Another masque, The Triumphs of the Prince D'Amour, followed in 1636. The poet returned to the legitimate drama by the publication of the tragi-comedy of The Platonic Lovers, and the famous comedy of The Wits, in 1636, the latter of which, however, had been licensed in 1633. In 1636 William Davenant secured a royal patent from Charles I to build an opera house in London (because of the Civil War and subsequent closure of the theatres in 1642 this never materialized.) The masque of Britannica Triumphans (1637) brought him into some trouble, for it was suppressed as a punishment for its first performance having been arranged for a Sunday. By this time Davenant had, however, thoroughly ingratiated himself with the court; and on the death of Ben Jonson in 1637 he was rewarded with the office of poet-laureate, to the exclusion of Thomas May, who considered himself entitled to the honor. It was shortly after this event that Davenant collected his minor lyrical pieces in a volume entitled Madagascar and other Poems (1638); and in 1639 he became manager of the new theatre in Drury Lane. The civil war, however, put a check upon this prosperous career; and he was among the most active partisans of royalty through the whole of that struggle for supremacy. 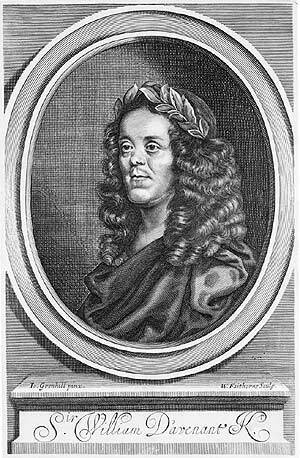 As early as May 1642, Davenant was accused before the Long Parliament of being mainly concerned in a scheme to seduce the army to overthrow the Commons. He was accordingly apprehended at Faversham, and imprisoned for two months in London; he then attempted to escape to France, and succeeded in reaching Canterbury, where he was recaptured. Escaping a second time, he made good his way to the queen, with whom he remained in France until he volunteered to carry over to England some military stores for the army of his old friend the earl of Newcastle, by whom he was induced to enter the service as lieutenantgeneral of ordnance. He acquitted himself with so much bravery and skill that, after the siege of Gloucester, in 1643, he was knighted by the king. After the battle of Naseby he retired to Paris, where he became a Roman Catholic, and spent some months in the composition of his epic poem of Gondibert. In 1646 he was sent by the queen on a mission to Charles I, then at Newcastle, to advise him to part with the church for his peace and security. The king dismissed him with some sharpness, and Davenant returned to Paris, where he was the guest of Lord Jermyn. In 1650 he took the command of a colonizing expedition that set sail from France to Virginia, but was captured in the Channel by a parliamentary man-of-war, which took him back to the Isle of Night. Imprisoned in Cowes castleuntil 1651, he tempered the discomfort and suspense of his condition by continuing the composition of Gondibert. He was sent up to the Tower to await his trial for high treason, but just as the storm was about to break over his head, all cleared away. It is believed that the personal intercession of Milton led tothisresult. Another account is that he was released by the desire of two aldermen of York, once his prisoners, whom he had allowed to escape. Davenant, released from prison, immediately published Gondibert, the work on which his fame mainly, rests, a chivalric epic in the four-line stanza which Sir John Davies had made popular by his Nosce teipsum, the influence of which is strongly marked in the philosophical passages of Gondibert. It is a cumbrous, dull production, but is relieved with a multitude of fine and felicitous passages, and lends itself most happily to quotation. During the civil war one of his plays had been printed, the tragedy of The Unfortunate Lovers, in 1643. One of his best plays, Love and Honor, was published in 1649, but appears to have been acted long before. He found that there were many who desired him to recommence his theatrical career. Such a step, however, was absolutely forbidden by Puritan law. Davenant, therefore, by the help of some influential friends, obtained permission to open a sort of theatre at Rutland House, in Charterhouse Yard, where, on May 21st, 1656, he began a series of representations, which he called operas, as an inoffensive term. This word was then first introduced into the English language. The opening piece was a kind of dialogue defending the drama in the abstract. This was followed by his own Siege of Rhodes, printed the same year, which is generally regarded as the first English Opera and which was performed in 1656 at Rutland House. Davenant wrote the text but the score was the work of five composers, among them Henry Lawes and the young Matthew Locke. At this time, the theatres were closed and plays forbidden by law, although music was still played. It is possible that the entertainment was rather a way of getting round the law than an attempt to write a true opera. In 1660 he had the infinite satisfaction of being able to preserve the life of that glorious poet who had, nine years before, saved his own from a not less imminent danger. The mutual relations of Milton and Davenant do honor to the generosity of two men who, sincerely opposed in politics, knew how to forget their personal anger in their common love of letters. In 1659 Davenant suffered a short imprisonment for complicity in Sir George Booth's revolt. In 1661 Davenant converted a covered tennis court into Lincoln's Inn Fields theatre and presented an expanded version of The Siege of Rhodes. This was also the first theatrical production to use perspective scenery. Two other innovations in its production were the introduction of recitative and the appearance of a woman, Mrs Coleman, on the stage. Until the Restoration he continued to produce ephemeral works of this kind, only one of which, The Cruelty of the Spaniards in Peru, from 1658, was of sufficient literary merit to survive. Under Charles II Davenant flourished in the dramatic world; he opened a new theatre in Lincoln's Inn Fields, which he called the Duke's; and he introduced a luxury and polish into the theatrical life which it had never before known in England. Under his management, the great actors of the Restoration, Betterton and his coevals, took their peculiar French style and appearance; and the ancient simplicity of the English stage was completely buried under the tinsel of decoration and splendid scenery. Davenant brought out six new plays in the Duke's Theatre, The Rivals (1668), an adaptation of The Two Noble Kinsmen, which Davenant never owned, The Man's the Master (1669), comedies translated from Scarron, News from Plymouth, The Distresses, The Siege, The Fair Favorite, tragi-comedies, all of which were printed after his death, and only one of which survived their author on the stage. He died at his house in Lincolns Inn Fields on the night of April 7th, 1668, and two days afterwards was buried in Poets' Corner, Westminster Abbey, with the inscription "O rare Sir William Davenant!" In 1672 his writings were collected in folio. His last work had been to travesty Shakespeare's Tempest in company with Dryden. The personal character, adventures and fame of Davenant, and more especially his position as a leading reformer, or rather debaser, of the stage, have always given him a prominence in the history of literature which his writings hardly justify. His plays are utterly unreadable, and his poems are, usually stilted and unnatural. With Cowley he marks the process of transition from the poetry of the imagination to The poetry of the intelligence; but he had far less genius than Cowley, and his influence on English drama must be condemned as wholly deplorable. Adapted from an article originally published in Encyclopedia Britannica, Eleventh Edition, Volume VII. Anonymous. Cambridge: University Press, 1910. p. 851-2. Those errors which he passeth by.